Directions: Apply twice daily. As condition improves, reduce application to when necessary, usually once or twice weekly. 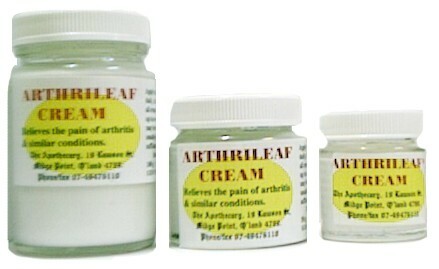 Comments: trials have shown Arthrileaf Cream to be beneficial for all types of arthritis. Although applied as a topical cream to the skin, the active ingredient from the Ngali Nut Oil is absorbed through the skin, so that although the cream is applied only to the hands, after a week or two other painful joints such as knees, shoulders etc begin to improve. It also has residual effect, in that if use is ceased abruptly, it takes several weeks before any pain returns. Available in: 25 g, 50 g, & 100 g glass screw top jars. It has been known since time began that the best way to deal with arthritis is to exercise. The problem is - it's bloody agony. That's the beauty of The Apothecary's Arthrileaf Cream - it reduces the excruciating pain usually associated with exercising arthritic joints, and because it is in the form of an externally applied cream, there are none of the side effects usually associated with internal anti-inflammatorys. Get relief from the pain & discomfort of arthritis** while helping to save South Pacific rain forests. Ngali nuts are native to the Solomon Islands, where they grow in great profusion in the rain forests. Until recently the local villagers were welcoming Asian logging companies to come and destroy their local rain forests in order to earn some cash for the village. Conservation International based in Washington D.C. is trying to reverse this trend by demonstrating to island villagers that they can earn equally good income from the native trees growing in the jungles surrounding their villages. The Apothecary has been working for years on researching the anti arthritic properties of Ngali nut oil, and today we now have The Apothecary, Conservation International & S.I.D.T. (Solomon Island Development Trust) all working together to convince S.I. village elders that it is in their best interests to preserve & protect their rain forest, in order to harvest the Ngali nuts from it. Currently, all nuts gathered for this current project comes from Makira, Eastern Province of S.I., but as word spreads it is hoped that other provinces will want to become involved. If successful, this should see the eventual end of all logging activities in the Solomons. It has been claimed many times that the world's rain forests should be protected because there is so much potential for discovery of new medicines in the yet-to-be-explored species, and this is the perfect example of how mankind can benefit from unique rain forest products. ii) residual effect, so sudden cessation of the cream didn't see the sudden return of pain, which took up to a month to return. It is important to understand that arthritis sufferers using ARTHRILEAF Cream for the first time should not change any existing medication or treatment they are presently on. *ARTHRILEAF is a registered trade mark. **The use of Ngali nut oil to relieve the pain & discomfort of arthritis & similar conditions is now patent approved in USA, Australia and South Africa. Other countries to follow.